The 88 Project – This is part one of the interview with Tran Huynh Duy Thuc’s father, Tran Van Huynh. He talks about his son’s innocence in regards to his 16-year sentence. Thuc was arrested under Article 88 of Vietnam’s Penal Code for “anti-government” propaganda. Thuc’s family was recently prohibited from leaving their house to deliver a petition to the government prior to the Vietnamese President’s trip to the US a few weeks ago. The signs read: “Tran Huynh Duy Thuc is innocent.”Click here for more information on Thuc. 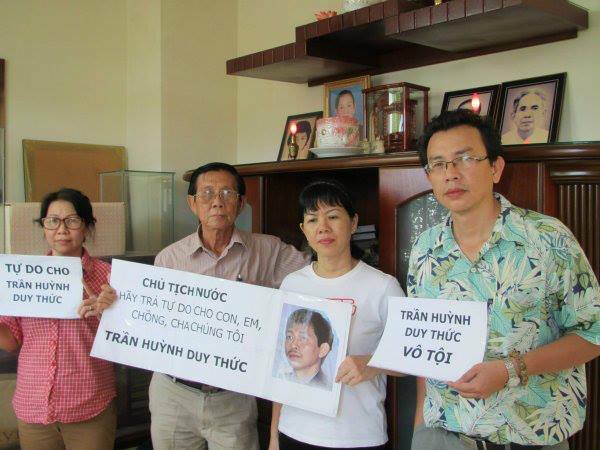 Tran Van Huynh – “I am Tran Van Huynh, father of Tran Huynh Duy Thuc – a Vietnamese citizen who was wrongly sentenced to 16 years in prison and 5 years of house arrest under article 79 of the Vietnam penal code.